What is the difference between Mac App Store and CK version? The standard version of Tonality is available exclusively on the Mac App Store, while the professional-level Tonality CK is only available on the Skylum website as a part of Creative Kit bundle. 1. Can be used as a plug-in and extension. 2. Can be used as a Smart Object when running in Photoshop. 3. Adds Layer-based Blend Modes. 4. Increases the number of Layers to 8 (from 5 in the standard version). 5. Adds the ability to use the original source color image for each Layer. 6. Upgrades the popular Vignette tool with Place Center and Luminosity controls, allowing you to truly highlight the most important subject of your photo. 7. Includes a Zone System readouts within the Histogram to balance gray shades for superior contrast. 8. Adds new shortcut keys for faster workflow. 9. Adds Tonal Range Clipping and Pixel Saturation features to the Histogram. 10. Has built-in batch processing. Can I upgrade from standard version to CK? They will send you a special link so that you’ll only pay the difference between the standard and CK versions. Please, note that you should have the Mac App Store version installed on your computer in order to activate the upgraded Pro version. Can I install Tonality CK on more than 1 Mac? You can install and activate Tonality CK on up to 5 Macs with one license key. How do I activate Tonality CK? 2. Click Activate on the welcome screen. 3. Then enter your email + activation code. Where can I find my license for Tonality CK? Enter your email address you used to activate Tonality CK under License Retrieval and hit Proceed. Click on “Email the license” next to Tonality Pro and find it in your inbox. Tonality CK is designed to receive all free software updates automatically. However, if for some reason this doesn't occur, or you want to make sure you're using the latest version, simply choose "Check for updates" in the Tonality CK menu in the upper left-hand corner (near the Apple logo). Tonality CK is available in these languages: English, French, German, Portuguese, Italian, Spanish, Dutch, Chinese, Japanese. Tonality is the most advanced and feature rich black & white image editor on Mac OS. With a fantastic and wholly complete set of darkroom-inspired features, Tonality allows you to easily create amazing fine art monochrome photos. How do I import and use textures in Tonality CK? 1. Download & save Textures to a Mac folder so you can find them. 2. Launch Tonality and open up the Texture Overlay Panel. 3. Click “Select Texture” and click the button “Load Custom Texture”. 4. Locate the Texture file you previously saved. 5. Your Texture will load and be available for use. 6. Adjust the Amount slider to control the opacity of the Texture. 7. Experiment with the Blend modes for additional creative options. Where can I get more free presets for Tonality CK? Visit the page: https://skylum.com/tonality-presets or click on “More presets” in the Presets Panel in Tonality. The new presets are compatible only with the latest version of the app. So, please, update Tonality CK to the latest version this way: launch the app > upload an image > click on Tonality CK in the top left corner > Check for updates > Install. Double click on the downloaded file or simply drag this file to the Tonality icon. It will immediately appear in your Tonality Presets Collection. What are the shortcuts in Tonality CK? Will it work as a Photos extension? 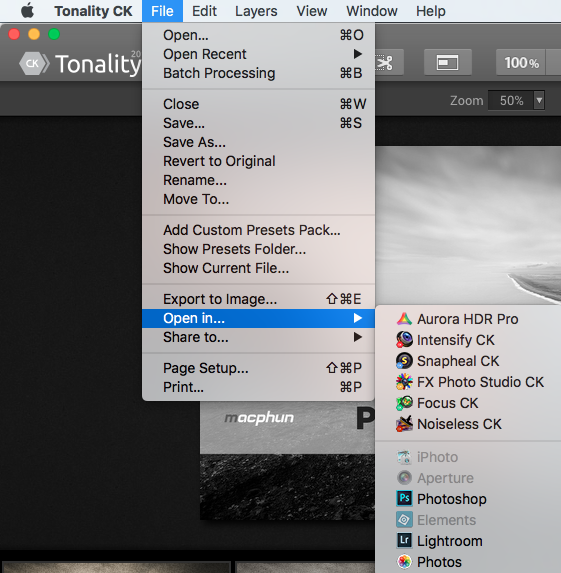 Yes, Tonality CK can be used as a Photos Extension on Mac OS X 10.11 or newer. How do I use Tonality CK as Photos extension? First of all, please make sure your Mac OS is not older than 10.11. After that, install Tonality CK as a Photos extension following the steps below. 2. Launch Photos application and open the image you want to edit in Tonality. 3. In the top-right corner click on Edit > Extensions. 5. After that, Tonality CK will be available as an extension in Photos. Will Tonality CK work as a plug-in? Yes, Tonality CK is integrated as plug-in with Lightroom 4, 5, 6 and CC; Photoshop Elements 10-14 (App Store version is not supported due to Apple Sandboxing); Apple Aperture 3.2 or later; Adobe Photoshop CS5, CS6 or CC 2014, СС 2015, СС. How do I install Tonality CK plug-ins? Launch Tonality CK, load an image, click on Tonality CK in the left top corner of the screen > "Install Plug-ins" menu. How to use Tonality CK as a plug-in in Lightroom? How to use Tonality CK as a plug-in in Photoshop? How to use Tonality CK as a plug-in in Aperture? How to transfer the edited image to another app? You can open the edited image in another app directly from Tonality CK by clicking on File > Open in… at the top menu bar, and choosing the desired app.